You know how it is, you have a desire in your heart that's been there for a long time. I've had a desire for a buffet for the shop from the day I opened almost 17 years ago. As luck would have it yesterday the desire of my heart came true times two. weather coming in the gal I bought them from rushed around to get them delivered before the rains came. I took a leap of faith and purchased them from pictures from my IPhone. This one is need of some desperate TLC. I'm not sure what all of this is, I'm hoping some scrubbing and a good polishing will take care of the whitish spot. The middle door is missing a handle or knob. IPhones are great and if the picture is taken correctly poor details are exposed. I should have looked a little closer, however I'm not concerned about finding a knob. At this stage finding the knob is the least of my worries. The handles mimic the ones on the highboy chest in my master. Here we are with Buffet # 2. It reminds me of one my grandma had. I'm sure that's where my deep desire to have a buffet comes from. Yes, this one is a little on the rough side as well. I "think" I'm up for the challenge of bringing the beauty of this piece back. Along with all the dirt and scratches there lies some beauty in there somewhere right? So she's missing part of a leg, at least she's up on some beautiful castor rollers. If you look past all the dirt, grim and scratches you can envision something beautiful. It will make a great display piece for the shop. I'm pretty pumped and anxious to get started on transforming the buffets. So... what do you folks think? 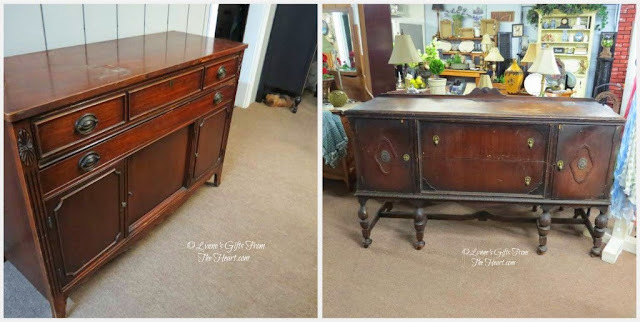 I gave under $200.00 for both pieces. Did I get a bargain? Would you have jumped on this great find? I"m going to let them set a couple of days, decide on what to do next. I know they need to be cleaned thoroughly. I'm hoping the one on the left will polish up nicely. The one on the right I'm afraid might have to be painted. I'll do some research and go from there. I would love your input, what would you do? 1. Clean, sand and re-stain, or 2. Clean, sand and then paint? That is amazing - can't believe you got both pieces for that price!! I love painted furniture, but know they will look great either way. Can't wait to see them after you work your magic! If I were doing it, they would definitely get painted, only because that is my fave. I grew up with lots of finished wood around me and now I can easily live without that. I love the painted and then antiqued look. I love watching things being transformed under your care & expertise. Since I'm not as brave as you are, when it comes to doing big jobs myself, I take them to my woodworker. Then I take over from there. Last year I picked up a wonderful old piece at a thrift shop. The base looks almost like a dry sink, but it has a back on it with a row of narrow drawers going across the top. Really lovely piece! I had it painted a pale chiffon yellow, Hubby changed the hardware to the hammered-black look. I put a strip of black/white checks with cherries various places on it. I wish you could see it. I am using it as a kitchen island/baking center with my bright red Kitchen-Aid, 1950's measuring cups/spoons and all sorts of neat little vintage things on it. My only regret? I forgot to take "before" pictures. Ugh! I agree with polishing up the one on the left, and painting the other one, due to its damage. Rained during the night here and dreary today, but at least it is not cold. You did the right thing, snatching these beauties up fast! Actually, I believe the one on the right will be beautiful with a clean and polish, but the one on the right is just right in every way to be a beautiful painted piece. And actually you wouldn't even have to repair the missing veneer or trims because with painted pieces they just add to the beauty of vintage! You will be so happy, I'm sure. Good job, Lynne, looking forward to the "afters" on these. I think you got a great deal. By the time you give them some tender loving care, they will look beautiful!! You have a couple of very nice wood pieces. After you clean and polish them, they will shine! Not sure if I'd paint or not. I love WOOD. Blessings to you and may you have a sweet week-end.